4 more pages from today's GLC #42 by Tomasi and Gleason. One page and a massive spoiler from the issue. Roy, Roy, a girl's (and a boy wonder's) best toy. How do you do it? The big war continues and the tide of battle turns. Follow the link to DC's Blackest Night covers and solicitations over at IGN. One of the tie in's has a current S_D favorite that will get a chance to shine against the Black Lanterns. I finally got a chance to play some "Arkham Asylum" this weekend. Very cool. I liked Oracle being in it but I wish they had gotten Dina Meyer to do her voice. Since I am in an Arkham mood, here are two pages from a 6 page story in "Secret Files & Origins, Gotham's Greatest Gangsters" about that time Kyle had to bring the Joker to Arkham Asylum. Garth Ennis' "Hitman" featured many memorable side characters. One of particular note was Bueno Excellente, "an obese, sweaty, and bald Latino in an overcoat who 'defeats evil with the power of perversion.' 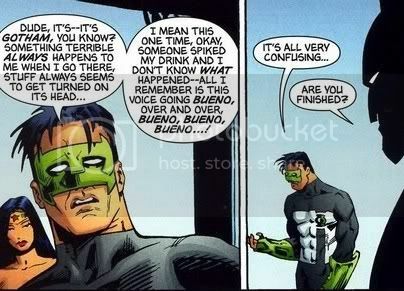 Generally, the only thing he says will be "Bueno", often preceded by a creepy chuckle." IGN has the preview of Green Lantern Corps #40. The scope of the horror unleashed is really felt as we go from location to location and see the Black Lanterns influence spread. The DCUBlog has the latest, wordless preview to Blackest Night. Yes, the s#@t has hit the fan, but it looks like we may have one genuine moment of welcome respite (before someone's heart gets torn out). Oh yeah, mild SPOILERS behind the cut. Kyle is pretty much Green Lantern for me, with John as an acceptable side choice. Hal's somewhat dull, Alan never really occurs to me unless I see him on the page, and Guy is a fun supporting character to one of the Lanterns I actually like. 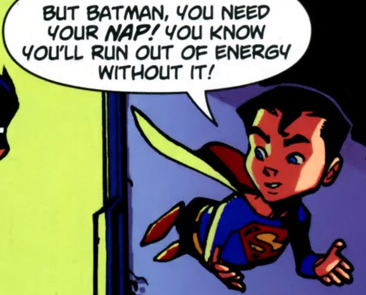 I got into Barry Ween a few years ago, and then found out that Judd Winick was writing Green Lantern at the time. I figured it'd be worth checking out, so I picked up a copy of GL #151. 3 pages from today's GLC #39. Be kind to the newbie! This is my first post, and I've been a lurker for some time. I just discovered comic books, and this community is a great way to familiarize yourself with the comic book worl-, er, multiverses. I <3 S_D! In light of certain developments in this month's WONDER WOMAN, I thought it might be interesting to go and dig up an old, potentially somewhat related SUPERBOY story from the hazy days of late '97, in which Kon teams up with the Legion, partners with Green Lantern, and tries very hard not to get his face melted. A very brief conversation on the virtues of secret identities and the questionable...uh...'modesty' of skintight superhero costumes. Well, this is my first post to this community. I must say that, in fact, I had already visited the old community, since (obviously) I'm a guy who really like comics, but, even if I know how to speak and write English, it isn't my native language, so, I sometimes make mistakes and I really wasn't sure if I wanted to join. But here I am! Now you shall suffer!!!!! Well, anyway, I guess this is just the beginning.